Approximately 100,000 pages on organrecitals.com are viewed every month. Each recital appears on 30-or-more pages across the website's various sections. Thousands of people go to concerts as a direct result of seeing them advertised here.  A master menu (the dark box near the top of each page) which contains links to a wide variety of specific listings.  Extra links in some entries, e.g. 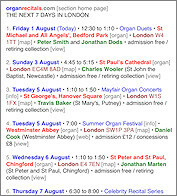 concert programmes, additional organ information, organists' biographies or websites.  Thumbnail pictures of venues, plus 'mouseover' symbols indicating refreshments available, console on view, etc.  Countdown displays showing the number of days to recitals. Options for sharing concert details.  Clickable TfL logos, for appropriate London entries, linking to details of engineering works that may affect journeys. parking arrangements) and links to additional transport/travel websites. London travelcard zones are noted, where appropriate. start-time band; grey for mornings, green for lunchtimes (12–2), blue for afternoons, red for evenings (from 6). The day colours are blue for Monday, pink/Tuesday, green/Wednesday, orange/Thursday, grey/Friday, brown/Saturday, yellow/Sunday.  Click on the picture for street view – available for most venues but not all. 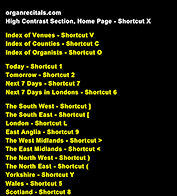  Hover your mouse over the picture to see text information, where available, about regular recitals at that venue. 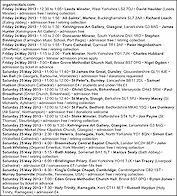  Click on the county to see the list of recitals in that county, or on the postcode for a map of the venue's location.  Click on a recital's start time to see the list of recitals in that time band.  Click on the day/date for recitals on that date, or on the month/year for recitals in that month.  Hover your mouse over symbols near the admission details for additional notes about that concert.  Click on the yellow number in the time band (to the right of the picture) to see that recital alone. Quick Links are located near the top and bottom of each page. Hover your mouse over one to see which page it opens. At the top of each page in the Main Section are links to the text-only sections. These contain varying amounts of detail.  The Mobile Section, for on-the-move browsing, is low on bandwidth but omits some non-essential information.  The High Contrast Section, designed for the visually impaired, includes only basic details, in order to not appear cluttered.  The Printable Section also contains only basic details, to go easy on ink/toner cartridges.